River Cruises in Iquitos Perhaps one of the most comfortable and luxurious ways of seeing the jungle is to take a river cruise down the Amazon. You may not see loads of animals or even virgin jungle but you will have time to relax, enjoy a good book and watch the world go by. You may also wine and dine in style or take an afternoon siesta in your air conditioned private cabin. 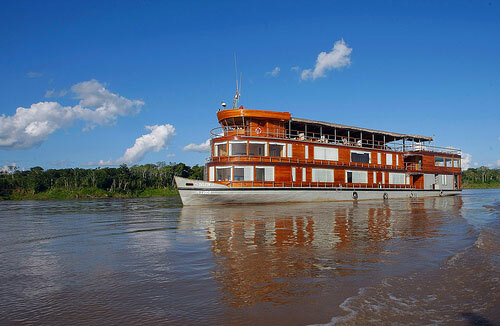 Some cruises also include day walks into the jungle and visits to local villages. Jungle Lodges Staying at a jungle lodge is one of the most popular ways of visiting the jungle. After a quick walk around Iquitos you'll be amazed at the number of lodges and tours on offer. Probably one of the largest, most efficient and long established companies is the highly recommended Explorama Tours. One of the advantages of booking into one of the Explorama lodges is that they also provide access to the canopy walkway at the Amazon Center for Environmental Education and Research (ACEER). The aerial walkway is now around 500m in length and over 35m from the ground, offering breathtaking views for bird-watching. Monkeys can also be spotted.